There's no escaping it now. 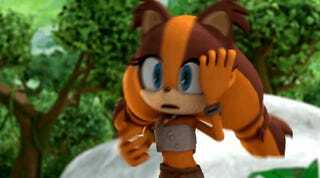 The next chapter of Sonic the Hedgehog history begins on November 8, when the Sonic Boom animated series premieres on Cartoon Network in North America. I think I could actually watch this. While my inner jury is still out on the games, Rise of Lyric (Wii U) and Shattered Crystal (3DS), I'm really digging the voice work in this trailer for the series, which will begin airing its 11-minute episodes next month. Roger Craig Smith and Colleen Villard reprising their video game roles as Sonic and Tails pleases me particularly, and Mike Pollock seems to be doing a fine job with this newer, leaner Dr. Eggman. The announcement was made this weekend at the Sonic Boom fan event in New York, where a new combined trailer for both games debuted as well. It's pretty Metal.